The Government of India, the State of Uttar Pradesh and Uttar Pradesh Power Corporation Limited(UPPCL), on behalf of DISCOMs of Uttar Pradesh (Dakshinanchal Vidyut Vitran Nigam Limited, Kanpur Electric Supply Company Limited, Madhyanchal Vidyut Vitrran Nigam Limited, Paschimanchal Vidyut Vitran Nigam Limited and Purvanchal Vidyut Vitran Nigam Limited) signed Memorandum of Understanding (MOU) under the Scheme UDAY – “Ujwal DISCOM Assurance Yojana” here today for operational and financial turnaround of the DISCOMs. The signing ceremony was held in the august presence of the Minister of State ( IC) for Power, Coal & New and Renewable Energy Shri Piyush Goyal. 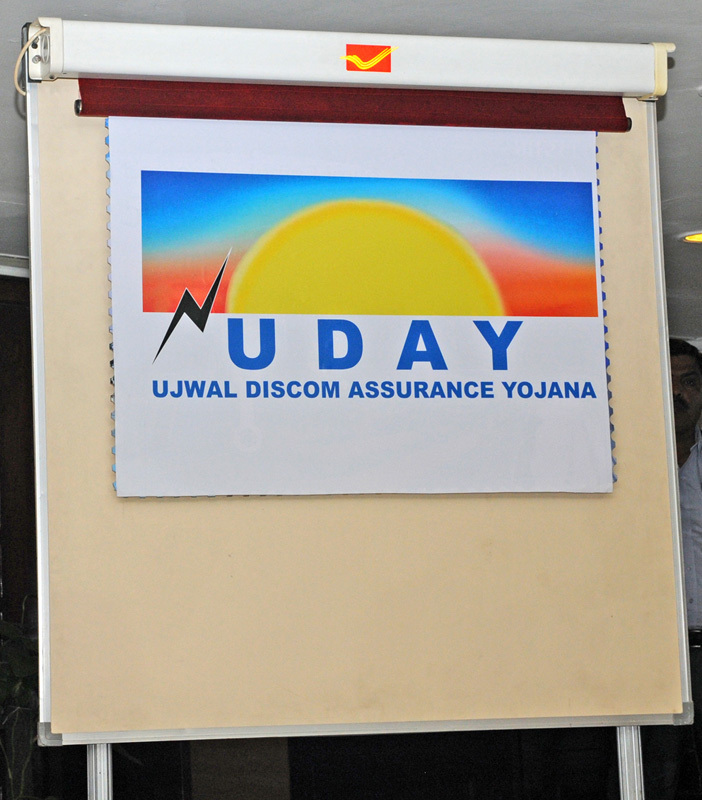 On the occasion of signing ceremony, Shri Goyal also unveiled the logo of “UDAY” scheme . Uttar Pradesh has joined the list of States that have accepted UDAY for bringing about a positive change in the Power Sector scenario of the States. Rajasthan, Chhattisgarh and Jharkhand have already signed the MoU under UDAY. The Distribution Utilities of the country are reeling under heavy debt burden. As on 30th September, 2015, the outstanding debt of the DISCOMs stood at Rs.4.3 lakh crore. 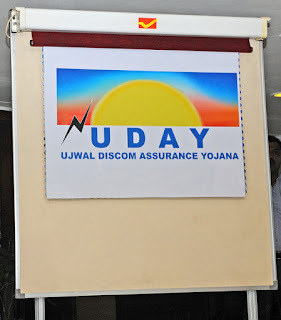 In order to bring relief to these Utilities from the burden of debt, and to improve their overall performance, Government of India launched the Scheme UDAY on 20thNovember, 2015, after a series of discussions with all the stakeholders, namely the State Governments, DISCOMs, lenders etc. UDAY is an aim to ensure a permanent solution to the debt-ridden Distribution utilities to achieve financial stability and to improve their operational efficiencies, for sustained growth. The Government of Uttar Pradesh has taken a major step towards improving the financial health of the DISCOMs by signing the MOU under UDAY and agreeing to take over the debt of the DISCOMs. The Government of Uttar Pradesh would take over Rs.39900 crore. of DISCOM debt, being 75% of the total DISCOM debt of Rs.53200 crore. outstanding as on 30.09.2015, as envisaged in the scheme. The scheme also provides for the balance debt of Rs.13300 crore. to be re-priced or issued as State guaranteed DISCOM bonds, at coupon rates around 3% less than the average existing interest rate. The annual saving in the interest cost to the DISCOMs would be around Rs.1600 crore. on account of State take-over of debt and reduction in interest rates on the balance debt. Besides helping the DISCOMs to bring about financial turnaround, UDAY lays stress on improving operational efficiencies of the DISCOMs. During the period of turnaround, the State of Uttar Pradesh and the DISCOMs will bring about operational efficiency through compulsory Feeder and Distribution Transformer metering, consumer indexing & GIS mapping of losses, upgrade/change transformers, meters etc., smart metering of high-end consumers, thereby bringing about reductionh in transmission losses and AT&C losses, besides eliminating the gap between cost of supply of power and realisation. The reduction in AT&C losses and transmission losses to 15% and 3.95% respectively is likely to bring additional revenue of around Rs.17700 crore. during the period of turnaround. With the financial turnaround through financial and operational efficiencies, the rating of the DISCOMs would improve, which would help them in raising cheaper funds for their future capital investment requirement. This is expected to provide interest cost saving of around Rs.200 crore. to the DISCOMs. While efforts will be made by the State Government and the DISCOMs to improve the operational efficiency of the DISCOMs, and thereby reduce the cost of supply of power, the Central government would also provide incentives to the DISCOMs and the State Government for improving Power infrastructure in the State and for further lowering the cost of power. The Central schemes such as DDUGJY, IPDS, Power Sector Development Fund or such other schemes of MOP and MNRE are already providing funds for improving Power Infrastructure in the State and additional/priority funding would be considered under these schemes, if the State/DISCOMs meet the operational milestones outlined in the scheme. The State shall also be supported through additional coal at notified prices and in case of availability through higher capacity utilization, low cost power from NTPC and other CPSUs. Other benefits such as coal swapping, coal rationalization, correction in coal grade slippage, availability of 100% washed coal would help the state to further reduce the cost of Power. The State would gain around Rs.5600 crore. due to these coal reforms. Energy Efficiency is also one of the focus areas of UDAY. In order to help reduce the peak load and reduce energy consumption the State of Uttar Pradesh, the State Government and the DISCOMs would promote usage of energy-efficient LED bulbs, agricultural pumps, fans & air-conditioners, efficient industrial equipment through PAT (Perform, Achieve, Trade) etc. The saving is expected to be around Rs.3500 crore. The ultimate benefit of signing the MOU would go to the people of Uttar Pradesh. Higher demand for power from DISCOMs would mean higher PLF of Generating units and therefore, lesser cost per unit of electricity thereby benefitting consumers. The DISCOMs would also increase power supply in areas with reduced AT&C losses. The scheme would allow speedy availability of power to around 490 villages and 143.54 lakh households in Uttar Pradesh that are still without electricity. Availability of 24x7 power to hitherto unconnected villages/households etc. would boost the economy, promote industries, thereby improving employment opportunities and see Uttar Pradesh develop into one of the leading industrialised States in India. Uttar Pradesh would derive an overall net benefit of approximately Rs.33000 crore. through UDAY, by way of savings in interest cost, reduction in AT&C and transmission losses, interventions in energy efficiency, coal reforms etc. during the period of turnaround. UDAY is hence an effort not only to make the DISCOMs financially and operationally healthy, but also enable the Government to brighten and transform the lives of millions of people.